We would like to inform that JUX Cryptocurrency Ticker has been released with lots of expected features. The module is a complete solution for nicely displaying real-time prices, changes, market cap, volume, coin charts, and updates of more than 1500 cryptocurrencies in multi-styles on your Joomla site. The fascinating module quickly grabs data from major cryptocurrencies exchanges using coincap.io APIs to show current market prices. Furthermore, users are able to manage font, background colors or position (header, footer, and static) as you wish in a convenient way. The module shows you the name of the cryptocurrency, its logo, current price, changes, and market cap only or sometimes adding 7-day price charts following your aim. The Joomla ticker deserves customers a simple way to set up an eye-catching cryptocurrency ticker on their Joomla site with these below core features. The modules directly use CoinCap rankings APIs to immediately show the real-time prices, changes, market cap, volume, coin charts, and updates of more than 1500 types of cryptocurrency from coincap.io. The Joomla ticker will provide the price, market cap, volume, and change following real-time, hourly to 7 days exactly. 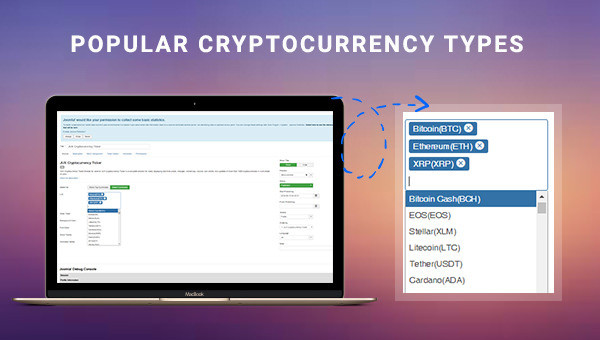 Users easily get essential information of every type of cryptocurrency in a beautiful tooltip that offered by this Joomla module. Furthermore, you can get lots of options in Tooltip animation such as Fade, Swing, Slide and so on. JUX Cryptocurrency Ticker comes with three primary styles which are different in colors, texts, especially the information which each type will show up. You can choose a simple type with its name, logo, current price, changes, and market cap only or sometimes adding 7-day price charts following your aim. 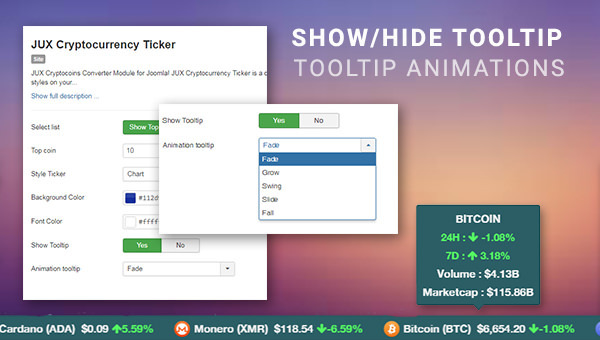 You will get more options in displaying your awesome ticker with JUX Cryptocurrency Ticker with three popular positions - Top, Bottom, and Static. So, you can select the suitable ticker position for your Joomla site. The awesome module also gives users a great selection with the expectation in showing more data with 7-day price chart style. With this style, you can get an overview in the previous week to make a better plan for the next 7 days. JUX Cryptocurrency Ticker offers various types of background colors and texts. Hence, you can freely choose any texts and colors you love for your ticker; however, you should choose background colors and texts which is a good combination to give a good-looking appearance of your ticker. The module allows users easily and quickly choose any type of top cryptocurrencies to show up on their ticker. 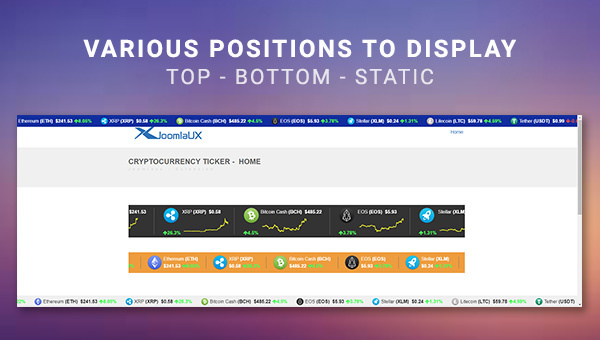 All in all, JUX Cryptocurrency Ticker is a power Joomla module in Cryptocurrency field if you are gonna build up a cryptocurrency site basing on the Joomla platform. The amazing module covers you almost of stunning features of a professional ticker as the multi-styles ticker, tooltip options, and 7-day price charts. Furthermore, users can custom whatever they want because we create the module with the aim of giving users as many options as a ticker can own in the simplest way to build up.